What a beautiful butterfly! True to its reputation for quality and beauty, REGENCY has created this charming creature in the loveliest of aquamarine blue glittering rhinestones. The body feautures a circular pale blue cabochon and elongated darker sky blue stone that serve to both compliment and highlight the sparkling rhinestones found in the graceful wings of this loveable butterfly. Measuring 1 3/4" in both length and width, it is set in a rich silver tone and comes in mint condition. 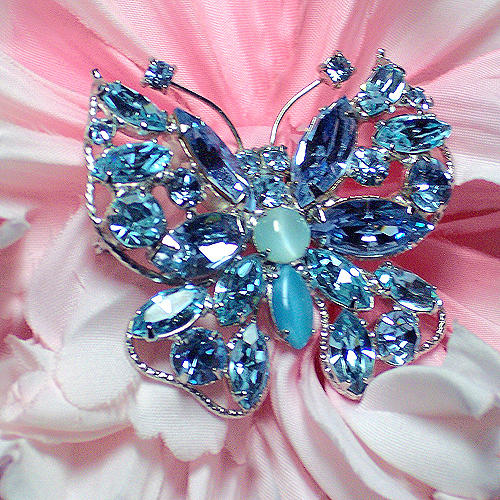 You'll fall in love with this dreamy brooch and so will everyone who sees you wearing it!